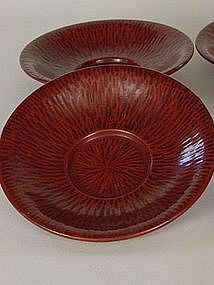 Kamakurabori, the lacquerware of Kamakura City in Kanagawa Prefecture, is appreciated all over Japan. 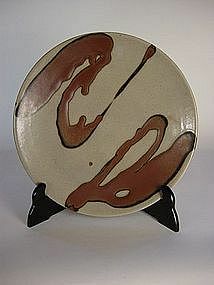 This set of pre-war "chataku" tea cup coasters is a fine example of this craft. 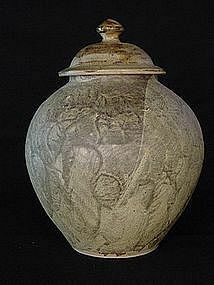 They measure 15cm(6") in diameter, with a height of 2.5cm(1"). Plenty of references are available on this craft that has its origins in producing lacquered wood carving for the numerous Buddhist temples of Kamakura during the 11th & 12th centuries. 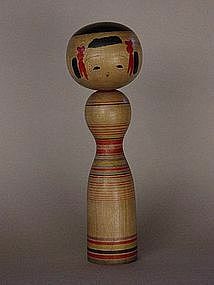 Kokeshi, wooden folk toy of NE Japan. 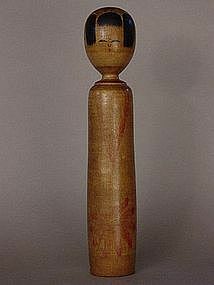 Heights: 1.1875", 1.75", 2.375". This are examples of the "Naruko-kei" tradition of Miyagi Prefecture. 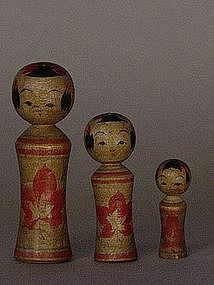 These miniature kokeshi are generally referred to as "issun kokeshi" (one 'soon' [inch] kokeshi). For a brief story on "dentou" (traditional) kokeshi, please see our weblog, which is accessible through our Trocadero homepage. 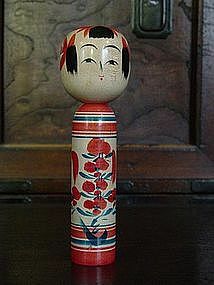 Kokeshi, wooden folk toy of NE Japan. Height: 8.5". This is an example of the "Yamagata-kei" tradition of Yamagata Prefecture. 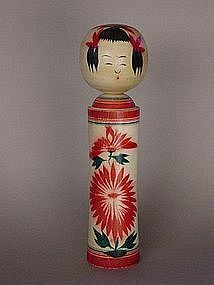 This kokeshi was made in the town of Toune by the artisan Yamaguchi Shuuichi, who was born on June 21, 1924 (Taisho 13.) 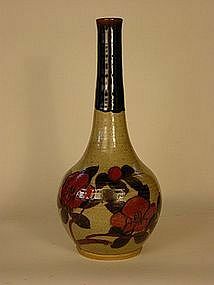 It is not dated, but was most likely made during the 1970's or early 1980's. For a brief story on "dentou" (traditional) kokeshi, please see our weblog, which is accessible through our Trocadero homepage. 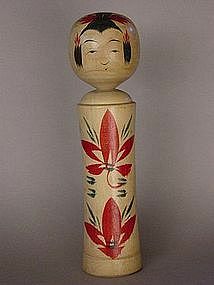 Kokeshi, wooden folk toy of NE Japan. Height: 7.5". 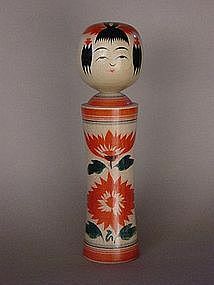 This is an example of kokeshi made in Fukushima Prefecture, other than its better known cousin of the "Tsuchiyu" tradition. 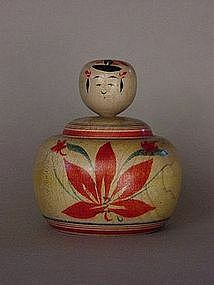 This was made in 1968 at Takayu Onsen (Takayu Hot Spring) by the artisan, Shinogi Toshio, when he was 37 years old. Shinogi-san was born on September 3rd, Showa 6 (1931). For a brief story on "dentou" (traditional) kokeshi, please see our weblog, which can be accessed through our Trocadero homepage. 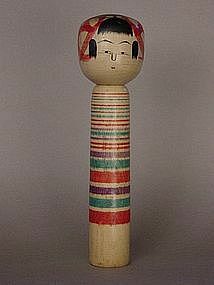 Kokeshi, wooden folk toy of NE Japan. Height: 8.5". 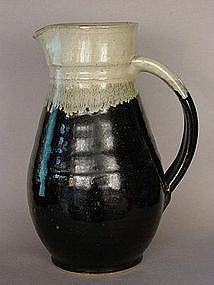 This is an example of the "Naruko-kei" tradition of Miyagi Prefecture. 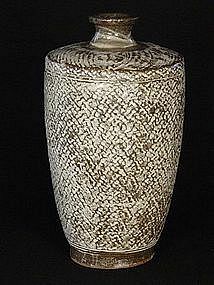 The artisan, Akiyama Tadaichi, was born in Meiji 34 (1901) and passed away on May 19th, 1984 (Showa 59.) For a brief story on "dentou" (traditional) kokeshi, please see our weblog, which can be accessed through our Trocadero homepage.